South Africa has one of the most active civil societies in the world, with more than 85,000 registered civil society organizations (CSOs). However, the growth of CSOs in post-apartheid South Africa does not necessarily imply that the sector is strong. While it is true that the demise of the apartheid regime increased democratic representation within South Africa, CSOs have experienced a series of institutional challenges which have weakened their organizational stability. This has included increased oversight by the state, inefficient and inconsistent funding from government, fickle demands by private donors, and competition from other sectors. 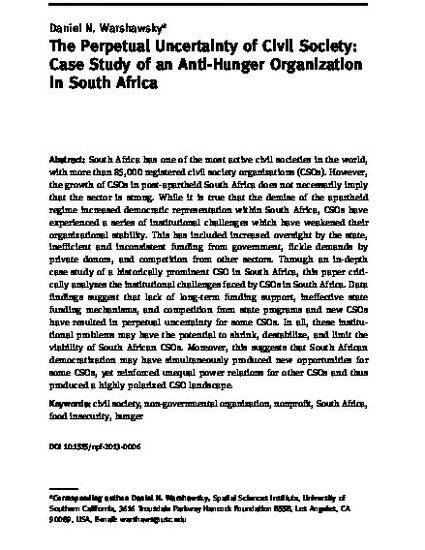 Through an in-depth case study of a historically prominent CSO in South Africa, this paper critically analyzes the institutional challenges faced by CSOs in South Africa. Data findings suggest that lack of long-term funding support, ineffective state funding mechanisms, and competition from state programs and new CSOs have resulted in perpetual uncertainty for some CSOs. In all, these institutional problems may have the potential to shrink, destabilize, and limit the viability of South African CSOs. Moreover, this suggests that South African democratization may have simultaneously produced new opportunities for some CSOs, yet reinforced unequal power relations for other CSOs and thus produced a highly polarized CSO landscape. This article can also be accessed on the publisher's website at https://dx.doi.org/10.1515/npf-2013-0006.